Project and Programme Management Professional Pack - is a bundled package that prepares you for a career in Senior level Project Management and Programme Management. 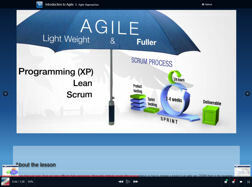 It includes accredited content covering best practice in Project, Agile and Programme Management. This premium bundle will prepare you for a qualification in PRINCE2® Project Management, AgilePM® Project Management and MSP® programme Management. It aims to provide you with a straightforward (self-paced) route to becoming a registered practitioner in all of these three methods. Please place an order on the deal site before the offer ends. You will be provided with a Voucher code. To Redeem the voucher, please return to this page and click on 'Redeem Now' against the package above. Enter the Groupon Voucher Code to apply the offer price. You will then be provided with your online access to the learning material. When you have completed the learning, follow the steps here to claim your PDUs. If you wish to sit the certifying exams then please contact SPOCE to purchase and arrange your online exams (note: 3 weeks advance notice is required). Prices above will be adjusted to zero when a valid Voucher Code is entered on the payment page. The package above provides 6 Months access to the accredited eLearning package which covers both the Foundation and Practitioner level study. Accredited exams are available separately as optional upgrades at additional cost. Exams can be taken online using your PC, Webcam and Microphone from the comfort of your own home. Please note the Certificates are issued by the examining body only on passing the relevant exam. Please click on the tabs below (Contents, Upgrade Options, Study Time, Taking the Exam, Tech Requirements, etc) for more information. Please email offers@spoce.com, call on +44 1202 736373 or click 'Contact Us' above for any clarifications. What does Passport eLearning contain? PRINCE2® / AgilePM® / MSP® Passport e-Learning contains full learning modules for both Foundation & Practitioner level study and qualification, so if you did wish to continue your Foundation level learning to Practitioner level, then there is no need to purchase additional e-learning. If you do wish to upgrade to take your Foundation and/or Practitioner Qualification, then please see the "Upgrade Options" tab above. Foundation and Practitioner exam simulations with adaptive feedback. We recommend that the upgrade to Practitioner is considered at the start of your learning period. Both Foundation & Practitioner Qualification packs can also be purchased together or as you go along. # Purchased exams must be booked and taken within the licensed study period. Please note we require three week's notice to arrange the exams for your preferred date. Two levels of qualification are available; Foundation Level and the higher Practitioner Level. Foundation Level study is intended for those who will be part of a project team operating in a project/programme environment. This level of training ensures that all associated with the project/programme are aware of the project/programme's structure and organisation and their part within that structure. Practitioner Level study is aimed at those who will be managing a project/programme within the project environment. This level of study requires more analytical skills to interpret the situation and to propose and manage the appropriate PRINCE2® / AgilePM® / MSP® response. You will need to commit approximately 20 hours to complete the Foundation Level study prior to taking your exam. Similarly, we recommend approximately 40 hours (cumulative, including the 20hrs for Foundation) of study for Practitioner Level study. Depending on other commitments, you will require anything from 4 weeks to 6 months to complete this learning and exam. Purchasing this product provides you with a license to use PRINCE2® + AgilePM® + MSP® Passport Online for the specified period from the date of your purchase. During this period the product is supported to ensure that the content is consistent with the published AXELOS/APMG examination syllabus. It is advisable to identify a date for completion of the self-study to help focus on completion. You will need to confirm your exam date with SPOCE a minimum of 3 weeks prior to your chosen date. Failure to attend your confirmed exam event may result in transfer charges being applied (see Terms & Conditions). You can choose to take your exams either online or at one of our exam centres. In order to make the necessary arrangements, we require a minimum of 3 weeks notice. Exams are provided through an independent accredited Examination Institute. No matter whether you choose On-line or Classroom exams, you will be asked for proof of identity when you sit the exams. This may be in the form of Photo Driving Licence or Passport. This exam option is available using your own PC or Laptop and allows you to take the exam in the comfort of your own home at a convenient time without the need for a physical invigilator. It is Ideal for candidates who may not have access to exam centres or those who may not be able to get to an exam centre. To use this service, your PC or Laptop will need to be equipped with a webcam, microphone and broadband internet connection. Your machine should be equipped with the latest service packs and Adobe Flash Player is also required. Important notes: You will be required to provide a 360 degree view of the room, and therefore your webcam should be portable enough for you to complete this. Headsets/earphones are not permitted during the exam, and therefore a microphone that is integrated with a headset/headphones will not be permissible. The Online Exam options should not be seen as being easier than sitting in a classroom environment. Very stringent rules are applicable to these exams and any infringement of the rules will render your examinations void. PRINCE2 Passport is eligible for up to 30 Category - C PDU's. Here is your guide to PDU's and the process to claim them. The online exam option is available using your own PC or Laptop and allows you to take the exam in the comfort of your own home at a convenient time without the need for a physical invigilator. It is Ideal for candidates who may not have access to exam centres or those who may not be able to get to an exam centre. To use this service your PC or Laptop (Supported on Windows or Mac, see full technical requirements in links below; Not supported on Linux, Smartphones or Tablets at this time) will need to be equipped with a webcam, microphone and broadband internet connection. Adobe Flash Player is also required. Important notes: You will be required to provide a 360 degree view of the room, and therefore your webcam should be portable enough for you to complete this. Headsets/earphones are not permitted during the exam, and therefore a microphone that is integrated with a headset/headphones will not be permissible. You will also be asked for proof of identity when you sit the exams. This may be in the form of Photo Driving Licence or Passport. This system records your exam session for later review by the proctoring organisation. Please see the Remote Proctor Now Candidate Guidance and the Remote Proctor Now User Guide for full details of the system requirements and conditions of use. This system uses a live video link to the proctoring organisation. Please see the Remote ProctorU Candidate Guidance for full details of the system requirements and conditions of use.